This is a new projext where I have begun to compile info I gather about companies that produced antique bottles. Please feel free to contribute additional info by sending me an Email. James Cook Ayer began selling his pills locally in Lowell, Mass. where he owned a drugstore in 1843. He claimed to have first sold the Cherry Pectoral in 1843 - it was actually about 1847 before it was first sold in bottles. In addition to the formula shown on page 19, the original formula contained syrup of squills, sweet spirits of nitre and spirits of bitter almonds. The pills were sold in boxes and it is most likely that it was first bottled about 1865. The Ague Cure was first bottled in 1858. The Sarsaparilla was first bottled in 1857, and the Hair Vigor first in 1867. Although Ayer claimed to be a graduate of Pennsylvania State University there is no record of him ever having received a degree from that institution. He was, in later years, able to edge in as a member of The Society Of Arts And Sciences, Chemical Institute, College of Pharmacology, The U.S. Medical Association and The College Of Physicians And Surgeons. Such was his claim in the 1860's. By that time he had become a very wealthy man and even helped finance a railroad from Boston to Lowell, Mass. He retired a multi-millionaire in the early 1870's and gave over the management of his patent medicine empire to a very worthy man, Mr. A. G. Cook, who continued to build the fortune for many years to come. After Ayer died, in 1878 at the age of 60, his brother Frederick assumed control. His widow became very prominent in society and later spent vast sums of the Ayer fortune in Europe. This info was taken from page 18 of Bill & Betty Wilson's "19th Century Medicine in Glass" book. Info supplied by John Heaphy jheaphy@azstarnet.com. 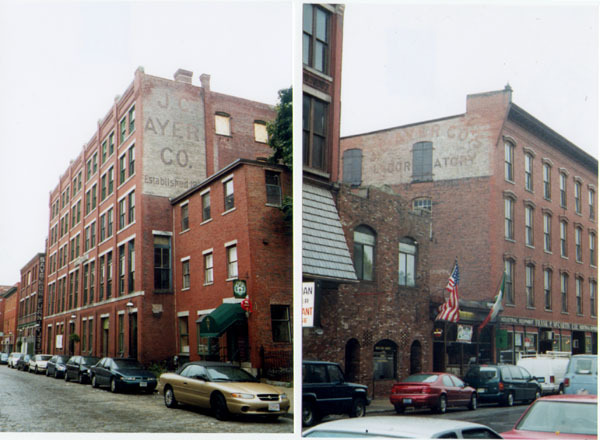 See Oct 1999 photo of the old Ayer's Building and Lab in Lowell, Mass, provided courtesy of Jimmy Greene who visited the locations. The building is being converted into lofts & the Laboratory is up for sale. Can see some Ayer's bottles under Cure, Medicine, and Hair. Also see some Ayer's trade cards. S. B. Goff was a prolific manufacturer of patent medicines at the end of the 19th century. He had at least 7 medicines: 1) Herb Bitters - very common 2) regular Cough Syrup - very common 3) Magic Oil - common 4) Worm Syrup - very rare 5) Sarsaparilla and Blood Purifier - very rare as listed in Sarsaparilla book 6) Indian Vegetable Cough Syrup and Blood Purifier - scarce. See some S.B. Goff bottles. Who Was Henry Helmold? is an article published by Digger Odell. Hire's Root Beer Extract - A Success Story is an article published by Digger Odell. Founder Dr. David Jayne began as a country doctor in NJ, but moved to Philadelphia in 1837 where he set up a practice. By April 1837 he moved to No 32 South Third Street. He started buying and selling medicines to patients, but then expanded to making his concoctions available to the general public. In 1845, Dr. Jayne moved to a larger establishment at No 8 South Third Street. In 1850 he moved to the famous address embossed on many of his medicines: No 84 and 86 Chestnut Street. He later died in 1866. His medicine business was a major success. He is credited with being the first to publish almanacs for advertising business. See some Dr. Jayne's Medicine bottles, including pontiled bottles, and Dr. Jayne's trade cards. The Kickapoo Indian Medicine Company is a article published by Digger Odell. See The Kilmers of Binghamton New York, an article that also appeared in the June 1997 issue of Antique Bottle & Glass Collector magazine. Article written/submitted by John Golley, Email: ByGolley@email.msn.com. Dr. Kilmer's Swamp Root is a very informative subject on the man and his products by Digger Odell. See some Dr Kilmer bottles under Medicines and Cures. See some Dr. Kilmer trade cards. The Larkin Soap Company by Digger Odell. The Miles Medical Company was founded by Dr. Franklin Miles around the mid 1880's (1884?). He sold out of the buisness to his partners several years later, but the company kept his name. The company was very sucessful and sold a lot of 'medicine' like Miles Nervine, New Heart Cure, etc. I think a big part of that sucess was due to the frequent advertising. They put out a lot of almanacs, calendars, and various phamplets. The were involved in a landmark Supreme Court case in 1912 (still often refered to today) about who decides what the retail price of a product should be (the manufacturer or the retailer?). The result of which is why you often see "Suggested retail price..." and not "Retail price". This debate still lingers on. In the 1930's the Miles Medical Co. had a "rebirth" with their hugely successful Alka-Seltzer product, which is still being sold today. The Miles Medical Co. under went several name changes "Dr. Miles Medical Co.", then "Miles Medical Co.", then "Miles Laboratories", and then I think simply "Miles, Inc.". This Elkhert, Indiana based company is now owned by Bayer, AG of Germany. Info provided by courtesy of Miles Medical collector Michael Miles (no relation), Email: mgm6@cornell.edu. The Oregon Indian Medicine Company is a story published by Digger Odell. See Glenn Poch's newsletter article on The Owl Drug Co. Still insists you'll need a man. Info adopted from the October 1998 newsletter of the SC Bottle Club. Dr. Townsend's Sarsaparilla was for the removal and permanent cure of all diseases arising from an impure state of the blood or habit of the system, vix; scrofula or Kings' evil, rheumatism, obstinate cutaneous eruptions, pimples or pustules on the face, blotches, biles, chronic sore eyes, ring worm, tetter scald head, enlargement and pin of the bones and joints, stubborn ulcers, syphilitic disorders, lumbago, spinal complaints and all disease arising from an injudicious use of mercury, ascites or dropsy, exposure or imprudence in life. It invariably cures indigestion or dyspepsia, neuralgia, general and nervous debility, palpitation of the heart, liver complaint and inflammation in the kidneys, ladies of pale complexion and consumptive habits and such as are debilitated by those obstructions which females are liable to. At the bottom of the wrapper, Townsend mentions that his competitors such as Sand's, Bristols, and Bull's, made inferior products.